★ International Summer Course for graduate and undergraduate students will be held from July 13 to July 17, 2019. The course will deal with basic taxonomy, molecular phylogeny, genome editing techniques and proteomic analysis, using marine invertebrates. 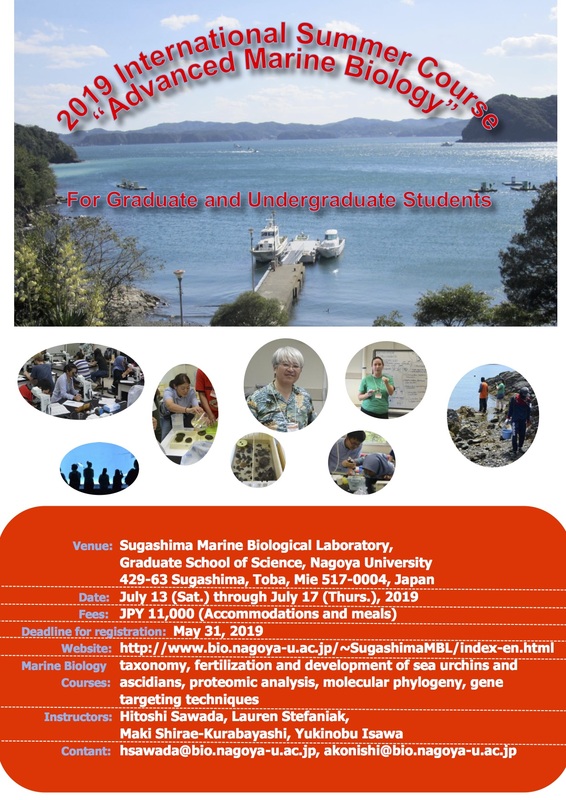 Those who are interested in joining this Summer Course in Sugashima MBL are requested to send an e-mail to Hitoshi Sawada (cc: Akiko Konishi) using a subject name of “International Summer Course”. Grant-in-aid for Scientific Research on Innovative Areas from MEXT, Japan, entitled "Elucidating Common Mechanisms of Allogeneic Authentication: Mechanisms of Sexual Reproduction Shared by Animals and Plants"